When this monster is destroyed as a result of battle and sent to the Graveyard, by paying 1500 Life Points, look at your opponent's hand and select 1 Monster Card from it. Add the selected card to you..
"Ground Attacker Bugroth" + "Sentinel of the Sea" .. When this face-down Defense Position card is attacked by your opponent's monster, you can make 1 opponent's monster (except the attacking monster) be attacked instead. While this card is face-up on th..
You can pay 500 Life Points to Special Summon this card when "Pyramid of Light" is on the field. This card cannot attack during the turn it was Normal Summoned or Special Summoned. This card cannot be..
"Fairy Dragon" + "Amazon of the Seas" + "Zone Eater" .. This card cannot be Special Summoned. This card returns to its owner's hand during the End Phase of the turn it was Normal Summoned or flipped face-up. This card can attack all monsters on your oppone..
By Tributing this face-up card, Special Summon in Defense Position a number of "Block Tokens" (Rock-Type/EARTH/Level 4/ATK 1000/DEF 1500) equal to the number of turns this card has been face-up on yo.. This card can only be Special Summoned by removing 1 LIGHT and 1 DARK monster in your Graveyard from play. Pay 1000 of your Life Points to send all cards in both players's hands and on the field to th.. When this card is Special Summoned, you can Special Summon as many"Crystal Beast" cards as possible from your Spell Trap Card Zone. If this card is destroyed while it is in a Monster Card Zone, you ca..
"Cyber Dragon" + "Cyber Dragon" + "Cyber Dragon&" A Fusion Summon of this card must be done with the correct Fusion Material Monsters. 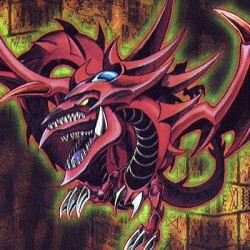 When this card attacks a Defense Position monster whose DEF is lo..
"Cyber Dragon" + "Cyber Dragon" + "Cyber Dragon" A Fusion Summon of this card must be done with the correct Fusion Material Monsters. When this card attacks a Defense Position monster whose DEF is low.. When this card is sent to the Graveyard, Special Summon 2 "Fluff Tokens" (Plant-Type/WIND/Level 1/ATK 0/DEF 0) in Defense Position. These Tokens cannot be Tributed for a Tribute Summon during the turn..
"Possessed Dark Soul" + "Frontier Wiseman" A Fusion Summon of this monster can only be conducted with the above Fusion Material Monsters. When a Normal Spell Card is activated, negate the effect by pa..